SCVHistory.com HS1903 | Newhall | Newhall Dairy Farms: One Quart Milk Bottle, 1940s-50s. 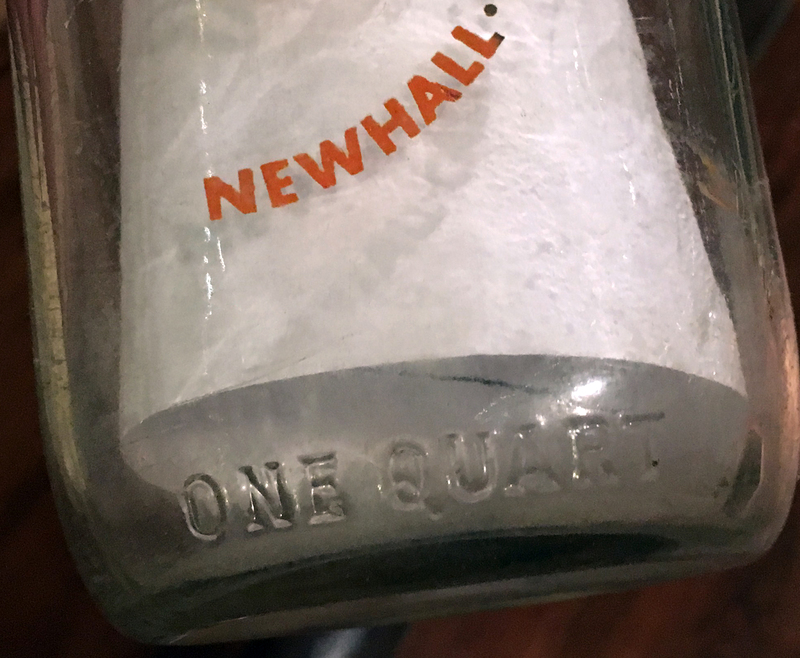 Newhall Dairy Farms: One quart (32 oz.) 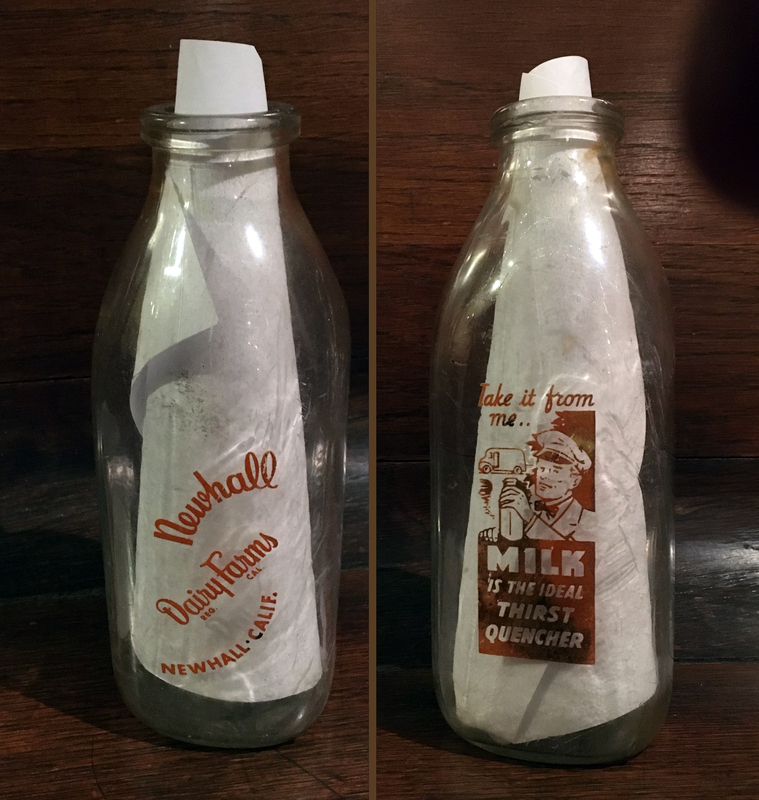 milk bottle, probably 1940s or 1950s. Donated January 2019 to the Santa Clarita Valley Historical Society by the Simi Valley Historical Society & Museum in the person of Carolyn Valdez, Strathearn Historical Park Site Director, Rancho Simi Recreation and Park District. There were several dairies in the Santa Clarita Valley in the middle of the 20th Century. We don't know much about Newhall Dairy Farms, except that it was owned by Bud Lutge, who also owned the Burbank Creamery in Placerita Canyon. Lutge (pronounced "LOO-jee") had an entry in Newhall's 1948 Fourth of July Parade. • Newhall Dairy Farms, 331 W. Linden, Burbank. Apparently the Highway 99 address is the property in the flood plain on the east side of today's Interstate 5, south of Lyons Avenue. Carolyn Karren writes (2017): "My Dad, John Ballard, delivered milk for Newhall Dairy from 1948 through 1951. You either got pasteurized or homogenized milk. No nonfat or 2-percent in those days. I went with him sometimes on weekends. The dairy was on Highway 99 which later was the Smiser mule farm." The Burbank address releates to the Lutge family's original Burbank Creamery, which they moved to Placerita Canyon. If you know more about the dairy, please leave a note in the "comment" section below. HS1903: 9600 dpi jpeg from digital images. Bottle in SCV Historical Society collection.